Für 2019 sind jetzt bereits im Vorverkauf erhältlich! Festival KOMBI TICKETS für beide Abende für CHF 85.- sind ausschliesslich via Häbse-Theater Basel unter 061 691 44 74 oder ticket@haebse-theater.ch buchbar! Über das Swiss Burlesque Festival wurde schon einiges in den Medien Berichtet. Seht Euch einige besondere Momente an. Wir bitten Sie höflichst darum elegant gekleidet an dieser Veranstaltung zu erscheinen. Die Schweiz hat auf diese besondere und funkelnde Veranstaltung gewartet. Es ist Zeit, die Sinnlichkeit dieses Landes zu zeigen und die Kunst des Burlesque zu zelebrieren. Zum dritten mal feiern wir das offizielle Schweizer Burlesque Festival im Häbse Theater Basel und verleihen gleichzeitig die „Swiss Crown of Burlesque 2019“. Am Freitag Abend veranstalten wir die Burlesque Gala Night inklusive Red Carpet am Eingang und zahlreichen glamouröse Künstlern aus aller Welt. Am Samstag Abend erleben Sie den Wettkampf um die "Swiss Crown of Burlesque 2019“. Eine 4 köpfige Jury, alle bekannt aus TV und Medien entscheidet über die GewinnerIn der "Swiss Crown of Burlesque 2019“. Durch die beiden Veranstaltungstage führt die international bekannte Burlesque Drag Queen Sheila Wolf. Das Schweizer Burlesque Festival wird von Scarlett Enterprises produziert, die Firma des international bekannten Showgirl und Model Zoe Scarlett und ihrem talentierten Team. Wir bieten Ihnen zwei Nächte Burlesque der extra Klasse! Switzerland has been waiting for this special and sparkling event. It's time to show the sensuality of this country and celebrate the femininity and the art of Burlesque. We are very happy to launch the third Swiss Burlesque Festival at the Häbse Theater Basel, Switzerland and crown the winner for the "Swiss Burlesque Crown 2019". On Friday evening we organize the Burlesque Gala Night including a Red Carpet at the entrance to get in the right mood and on stage glamorous artists from around the world. On Saturday night you can experience the competition for the "Swiss Crown of Burlesque 2019". 4 jury members, all known from TV & media, decides the winner of the "Swiss Crown of Burlesque 2019". The host of the two-day spectacle is the internationally known Burlesque DRAG-QUEEN Sheila Wolf. The Swiss Burlesque Festival is produced by Scarlett Enterprises directed by the international known Showgirl & Model Zoe Scarlett and her team. We offer you two nights of Burlesque at it's best! *** WIR BITTEN SIE, ELEGANT ANGEKLEIDET ZU KOMMEN, WENN MÖGLICH INSPIRIERT IM STIL DER 30ER BIS 50ER JAHRE. WIR WÜRDEN GERNE ALLE DAMEN IN GLITZERNDEN ABENDGARDEROBE SEHEN UND ALLE MÄNNER IN SCHICKER KLEIDUNG ODER SOGAR IM ANZUG. Es gibt verschiedene Möglichkeiten beim Swiss Burlesque Festival Partner oder Sponsor zu werden; zum Beispiel mit einem Werbespot Einspieler auf der Grossleinwand, Inserat im Souvenir Magazin, Produke oder Gutscheine in den Goodie Bags, Logo Platzierung auf der Fotowand und vieles mehr. We speak and write Swiss German / German & English don't hesitate to sent us your application in German if this is your language but of course all english application's are welcome we are international! If you are sending your application in English, we’ll translate your short BIO into German for the Swiss Burlesque Festival Booklet which all guests, artists and helping hands will receive at the event. However, we assume no liability if the text is not translated perfectly in the booklet but we do our best! This application is for those of you interested in performing on the Gala Night of the Swiss Burlesque Festival. This can be Burlesque, Boylesque, Variete, freak shows, glamour striptease, cabaret, artistic, drag or similar! We need one Act suggestion but you have the possability to sent us a second act suggestions if you want to. This application is for those of you interested in performing to win the ‘Swiss Crown of Burlesque 2019’. Wee need one Burlesque Act suggestion but you have the possability to sent us a second act suggestions if you want to. The application deadline is on March 30th - 2019. All performers must submit a URL video of the act they plan to perform. Please make sure it is not password protected and will not expire. Please consider easy sharing sites like youtube or vimeo. Do not use members/friends only hosts like Facebook. We will not accept video we have to download. As soon as we have you choosen YOU to be part of the festival (we get in touch), please attach your music in mp3, please rename the file with your stage name, for example ladymarmalade.mp3 and eventually ladymarmalade2.mp3. Please sent us the music via Dropbox or Wetransfer to application@swissburlesquefestival.ch and make sure your stage name is in the subject. Please do not sent us any Emails with your application, we won't have the possability to check it. We only accept applications with the form bellow. The only emails regarding your application we accept are the Pictures and Music mails. You will be informed via Email until Mai 2018 if you are selected to perform at the Swiss Burlesque Festival 2018. If you are not selected, you won't hear from us! 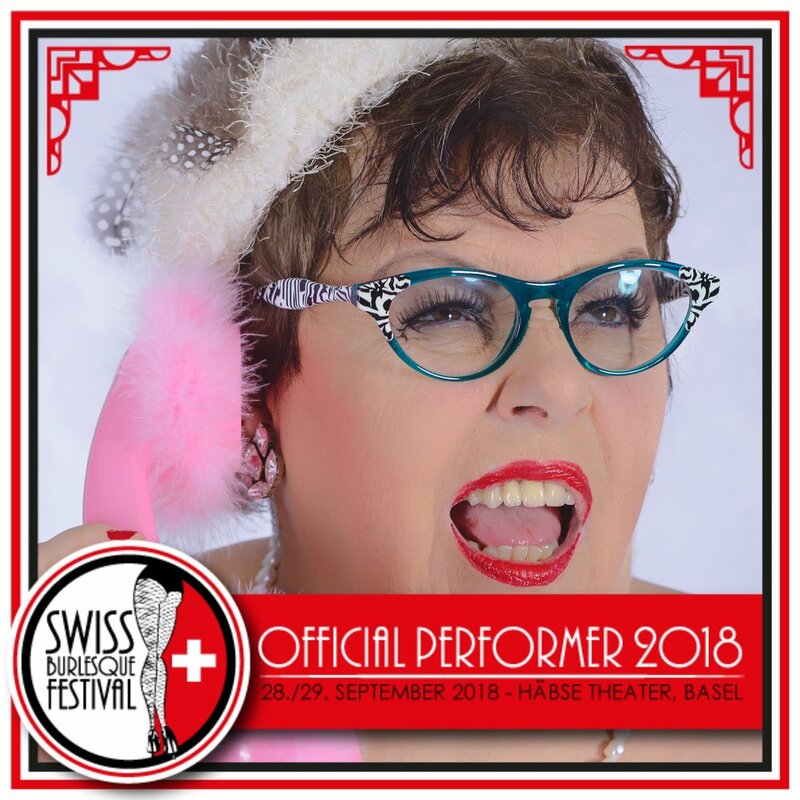 If you are selected to perform at the Swiss Burlesque Festival you have to confirm your performance within 7 days, if you fail to confirm your place will be given to another applicant. If you cannot commit (for any reason) to your confirmation of attendance to the Festival please let us know asap, if you fail to do so your application will not be considered in the future editions of the Festival. We offer all performers Catering - a warm and delicious meal right after the rehersals & light check. All non-alcoholic beverages are for free during the day and the show. We have big dressing rooms with great lighting and lot's of mirrors. You are also able to take a shower and relax in a extra room. We do have PhotoShootings in the Backstage and you'll receive a fantastic Goodie-Bag. All performers which are selected to be part of the Gala Night at the Swiss Burlesque Festival will receive a fee CHF 200.- in cash at the event and also everything above mentioned. All performers which are selected to be part of the Competition Night at the Swiss Burlesque Festival have the chance to win the title, the "Swiss Crown of Burlesque 2019“ and various special prices, CHF 500.- in Cash and also everything above mentioned. 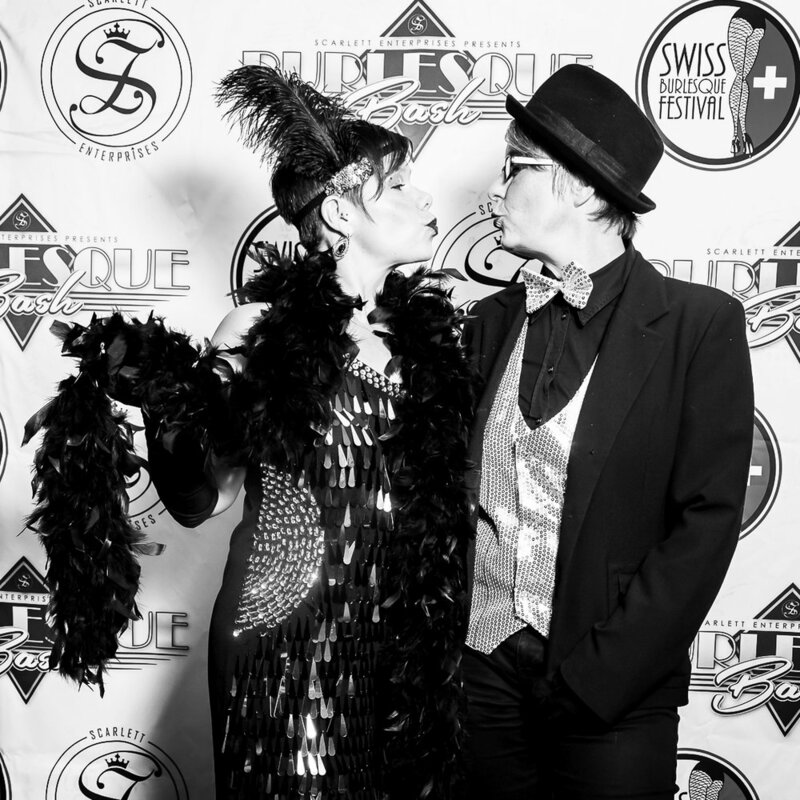 If you apply for the Swiss Burlesque Festival you agree that any performances at the Swiss Burlesque Festival will be video taped and photographed by photographers and videographers and the images may be posted on the homepage / all social media sites and used for future promotions of the Swiss Burlesque Festival.